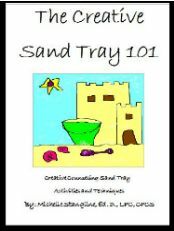 Rationale: For families in sand tray therapy, especially those who have difficulty listening to one another, in which roles of individual members or patterns of interactions may or may not be recognized in the family. It can also be used to help younger or less assertive members of the family have equal opportunity for representation. Purpose: To observe family dynamics when working together to create a sandtray; to utilize a medium through which the family can engage and communicate their individual perspectives and feelings with one another in a respectful way; to ensure all members of the family are given a voice to express themselves; to synthesize the narrative of the family; to create new ways of relating within the family when necessary; and to recognize and validate current strengths in family relationships; to give a voice to even the least assertive and/or youngest members of the family through utilization of the nonverbal expression of the sandtray and the talking stick. Using the talking stick provides a foundation of expectations for communication and opportunity for the therapist to observe interactions amongst family members that can be further understood through observations of the sandtray process. Materials: Large sandtray on table accessible from all directions; collection of diverse miniatures and items; talking stick (see "family talking stick"). Prior to starting the sandtray process with a family, have them decorate and label a talking stick to be used after creating the sandtray story. 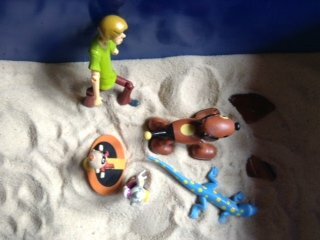 They must take turns placing items in the sand tray continuing the story. Everyone must participate equally, a concept introduced through the talking stick. 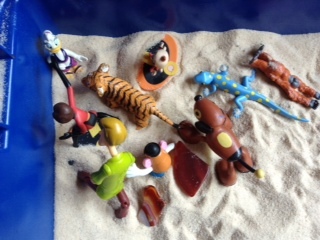 They also must not remove items that have been placed in the tray by others, though they may move them around (even burying them) in the sand as they choose to continue the story. The person who is taking a turn telling the story may choose to verbalize the action taken or move the items with silence. The members must observe in silence, so as to respect the voice of the person “telling” their part of the story. 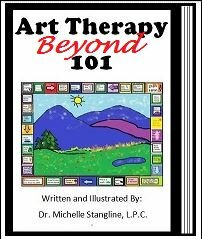 Once the story has been told, the therapist brings out the talking stick and reminds them of the meaning behind the items decorating the stick that will serve as the expectations for communicating respectfully and listening to one another. 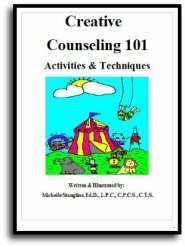 The therapist then asks the family members to share their individual perceptions, interpretations, and feelings that came up with the story. 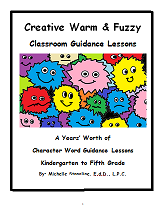 These can include ways they perceive the characters felt or feelings that personally came up for them during the process. 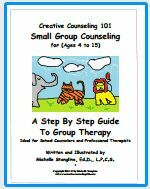 The members must listen to one another when describing their experience. How did this process feel to you? What was it like to create this world/story? What feelings do you think this miniature/character was feeling when…? Was there anything that happened in the story that you would like to change? What character do you most/least understand? Is there anyone you believe these characters/miniatures represent? Describe how they are similar. Are there any miniatures that could represent you? What about that miniature is like you? Which character needs the most support/love/guidance? If you could add something to the tray, what would you add? What makes this tray safe/unsafe? What does it need to feel better/safer? If this miniature could talk, what do you think it would say? What goals would you set for this character? What would you like for this miniature to tell another one? What is something you learned about yourself or surprised you in this process? What is something you learned about the members of your family or how you work together? 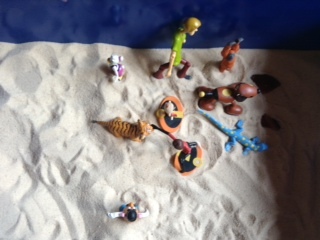 Example: In this sandtray, a father, a mother, and a daughter work together to create a sandtray story. The process above was not followed strictly but this serves as a representation of the family through the sandtray story and provides an illustration of how the process can give insight into the relationships and family processes. The father started by placing a man walking two dogs. The daughter added a little girl walking with the father. The mother then added a couple of additional miniatures on the walk, representing the brothers in the family who were not present for this tray. Then the daughter turned the girl away from the group and added a woman to the corner, saying the mom was at work. The girl then buried herself in the sand. The father placed a Mr. Potato Head off to the side watching with a lack of understanding how the girl buries herself in sand. The mother moved the woman closer to the family on the walk. The father then made the woman touch the head of one of the young boy animals. The daughter then made the woman/mom find the girl in the sand and them back home together and the woman/mom started telling the girl things she needed to do (take a bath, get ready for bed, etc.). The father then returned the other miniatures to the corner where the girl/woman were to join them at home. The girl then “felt crowded” and moved to another corner with one of the dogs. As this was my family, I was able to almost literally interpret this story and easily see the connections with our real life patterns. For example, the dad is often caring for the two dogs and taking them on walks, sometimes with just the daughter and sometimes joined by the brothers. When the brothers do come, sometimes the daughter feels ignored, maybe even invisible when the brothers are around and lost needing to be found by her mother. She then thought of her mom who has been working more than usual lately. When the mother comes to the group and touches the younger boys head, this represented how the mom (me), often checks in, even if momentarily, with the middle child before then finding and going together somewhere with the daughter. Once everyone returns, the daughter seeks calm and quiet again, leaves the group to retreat to her room and engages with the dog alone who doesn’t “crowd” her but provides company. At first, the father was unwilling to participate but was expected to do so and asked by the mother to make the first move. He reluctantly agreed. The daughter eagerly joined the process, almost taking over the story and making many of the choices for the miniatures. The mom took turns but served mostly as observer, making small moves to join the process. These are all illustrative of our family interactions and served as a clear example of how a simple story can demonstrate so much of reality in a family. A Family Virtues Tray by creating a family tray at the end of a family therapy process together illustrating their family values together and representing how they have come to balance one another in a positive way. Create a new story by having a family create a story they would like to be true of their family, one that provides safety, respect, kindness, etc. for all the members of the family yet in ways that each person is valued and able to function as an individual with individual goals and still respectfully as part of the family group. 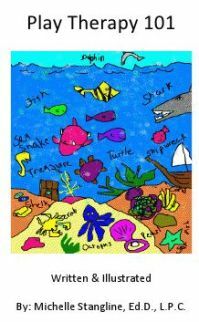 Create a tray in nature together by encouraging them to do this activity in the world outside of therapy. This could be on vacation or in their backyard or by taking a walk around the neighborhood. Create a genealogical tray, choosing together how they would like to represent members of their family throughout the generations, choosing miniatures to represent individuals or units with the greater family system.